3/22/2017Share this story on Facebook! Khalil Griffith '16. Photo by Adam Baker. Khalil Griffith ’16 knows the difference basketball can make in the life of a young person who is struggling because he’s experienced it firsthand.And this experience drove him to establish the Ithaca Elite Basketball Club (IEBC), a nonprofit youth basketball club, in 2014. Today the IEBC serves 125 players on 13 teams. Griffith cofounded the IEBC while serving as an assistant coach on the Ithaca High School boys’ basketball team. He and fellow assistant coach, James Williams, saw a lack of opportunities for students to keep playing basketball once the high school season ended. They also noticed that there were several families who couldn’t afford to pay for tournament fees, uniforms, travel, and other costs. In Tompkins County, New York, 13.1 percent of families with children 18 years or younger live below the poverty line. The African American and the Hispanic populations are disproportionately affected, with around 50 and 34 percent, respectively, living in poverty. Those children are often the ones who need the structure basketball can provide. “I don’t think that’s fair, to limit a kid based on their financial situation,” said Griffith. IEBC is an Amateur Athletic Union (AAU) travel club for kids in grades 4–12. The club’s teams play in AAU tournaments, and IEBC hosts its own practices, clinics, camps, and tournaments. The club also raises funds to help players defray certain costs. Griffith coached two IEBC teams. He also handled administrative work and was the face of the organization. The sport management major’s coursework–such as Sport Event and Facility Management–gave him the experience he needed to handle these roles. And all the work was worth it to him because he used to be in their shoes. Griffith’s life before Ithaca College was difficult. He said his father was abusive toward both him and his mother, and he hasn’t seen his father in nearly 18 years. His mother worked multiple jobs to provide for him. “Having that vacancy in my life, that void of a father, was very difficult for me,” said Griffith. The void was finally filled by Joe Serfass, Griffith’s high school basketball coach. Serfass was tough, and he taught Griffith to be accountable. But he was also a nurturing presence who became a father figure for Griffith and put him on the road to success. “Words really can’t describe what he means to me,” Griffith says. That may be because Serfass is still helping. 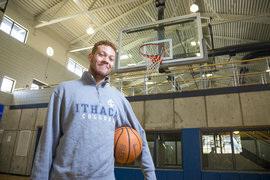 When Griffith was pondering what to do after graduation, he called Serfass and decided to enroll in the University of Connecticut sport management graduate program. When Griffith was deciding on colleges, he interviewed and was invited to be part of Ithaca College’s Martin Luther King Scholar Program. He told his interviewers that his life’s mission was to help others. Through the MLK Scholar Program, Griffith’s social consciousness was intensified. He learned that poverty often poses barriers to children who could benefit from sports. That’s why, for him, the IEBC is about more than basketball. “What we want to do is to develop the life skills of the youth and high schoolers, using basketball as a tool for post–high school plans like college,” he said. Many of the kids in the IEBC have difficult home lives. As a coach, Griffith pushes them to become better players, better students, and better people. And his own experience allows him to relate to his players. Now, he smiles like a proud parent when he talks about some of them. One of his players who previously seemed unlikely to graduate from high school has recently earned a college scholarship. “It’s rewarding to see these kids buy in and see what they could be,” said Griffith.